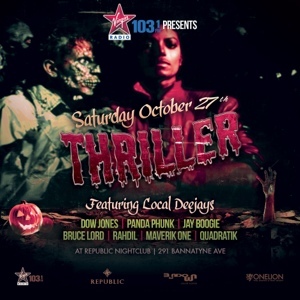 The upcoming weekend will mark the sixth year in a row for Thriller, the Halloween fete we started with local nightclub entrepreneur and long-time homey Stephen Hua. It will also mark the return of another long-time homey, Dow Jones, who did not appear last year, the first Thriller appearance for DJ Rahdil and the first time it is being sponsored by Virgin 103.1FM. What certainly hasn’t changed is the fact that on Saturday night, Bundown and Dow Jones will raise the dead and stir the spirits with a two-room, boom-bap-filled, soul-sprinkled night of fuelGOOD music! Project Pat, Nasty Mane, Juicy J – P.O.L.O.